Newton's Nook Designs: Inky Paws Challenge #2 Winner! We had so much fun checking out all the entries for our second Inky Paws Challenge at here at the Newton's Nook Designs blog. Everyone has been so creative and it's so much fun to see all the creations made with our stamp designs! I really enjoyed each and every project that was posted! This card by Crafty Math Chic was our top pick this month. What stood out was how she used the little fish and yarn stamps make the background patterns! I loved that! I also loved the color combo and the ball of yarn is just too cute! 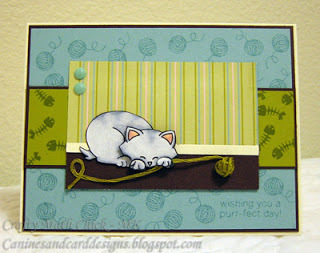 More details on this card are on her blog here (Canines & Card Designs). Congrats to the winner! e-mail at info@newtonsnookdesigns.com to claim your $10 store credit and get your winner badge for your blog! I love how Angela used a cloud and bird as the two dots part of the sketch! What a fun idea! 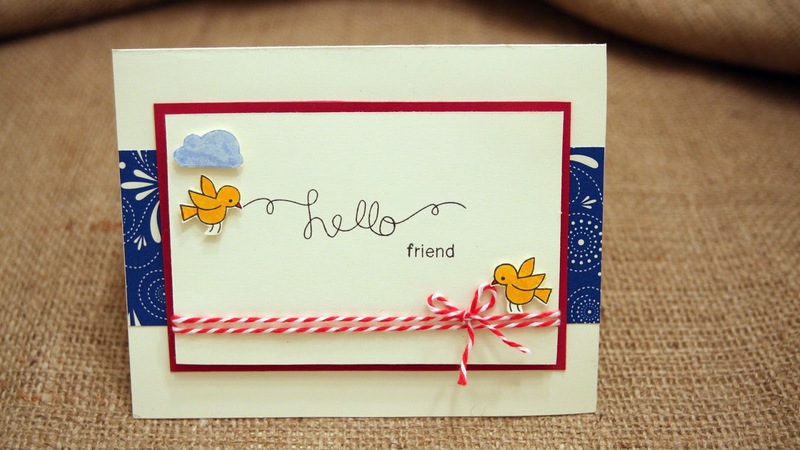 Love the fall color combo and stitching on this card by Chris! Thanks again to everyone who entered - We truly LOVE seeing all the entries! If you didn't win this time or didn't have a chance to play, check back again in a few weeks - we will be doing another challenge starting on September 20th! Make sure to visit us again tomorrow --- I will be previewing some cards with the brand new releases... and the following days we will feature the releases with our design team! It's going to a really fun week here on the blog!